Clinical Laboratory Sciences Program, Faculty of Health Sciences, University of Balamand, Beirut, LEBANON. Benta Pharma Industries, Debayeh, LEBANON. Cardiovascular diseases are, nowadays, viewed as the major cause of morbidity and mortality. They are due to complications from hypertension, thrombosis, thermogenesis, and Restenosis. In these pathologies, increased Vascular Smooth Muscle cells (VSMCs) hypertrophy, migration and proliferation promote their onset and progression. Furthermore, Nitric Oxide (NO), a vasoprotective molecule was shown to decrease the levels of inhibitory G alpha-protein (Giα) in VSMCs, thus indicating their possible involvement in its anti-proliferative effects. Peroxisome Proliferator Activated Receptors gamma (PPAR-γ) is linked to both NO and G-proteins. Establish that the anti-proliferative role of NO in VSMCs is mediated by decreased Giα while investigating the role of PPAR-γ as a modulator of these effects. A-10 cells and VSMCs were incubated with the NO donor sodium nitroprusside (SNP) and/or the PPAR-γ antagonist GW9962 (20 μM and 30 μM). Cellular proliferation was assessed by a cell proliferation assay, and Giα and PPAR-γ expression were assessed by western blotting. SNP and GW9962 resulted in decreased expression of Giα-2 and Giα-3 by 50% with no difference between individual and combination treatments. SNP had no effect on PPAR-γ activation; whereas GW9962 increased PPAR-γ inactivation by 30- 70%, with combination treatments having no effect. Furthermore, SNP and/or GW9962 following stimulation with ANG II showed that they decrease the proliferation of VSMCs by21.57%, 23.33%, and 27.54%. Combination treatments didn’t indicate an interaction between PPAR-γ and NO. these results show that NO and GW9962 may independently inhibit VSMCs proliferation and decrease Giα protein levels. 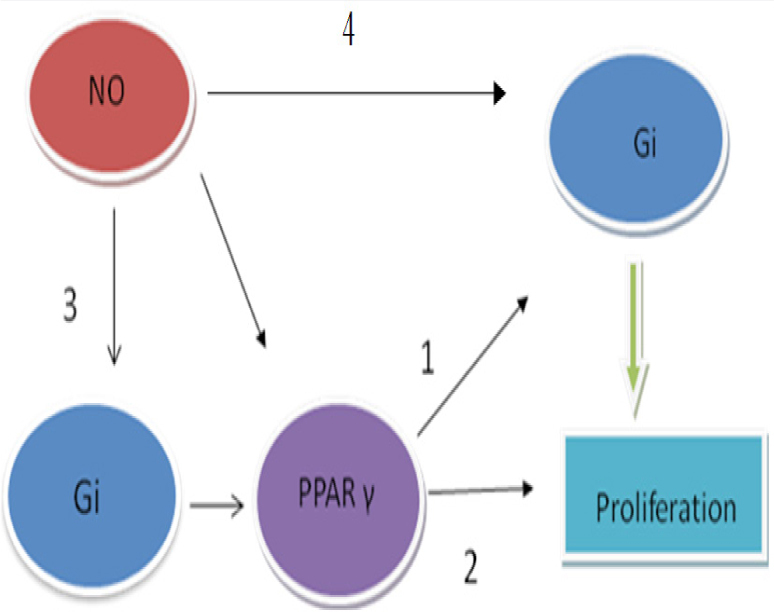 These studies suggest a possible relation between NO, PPAR-γ, and Gi in VSMCs, and the possibility that the anti-proliferative effect of NO might be due to the implication of PPAR-γ activity and associated with G-protein signaling. Primary VSMCs from rat aorta and A-10-SMCs were cultured as described previously.17 Cells were plated in 7.5 cm2 flasks and incubated at 37°C in 95% air and 5% CO2 humidified atmosphere in Dulbecco›s modified Eagle›s medium (DMEM) (with glucose, L-glutamine, and sodium bicarbonate) containing 1% antibiotics and 10% heatinactivated fetal Bovine serum (FBS) from Gibco, Invitrogen. 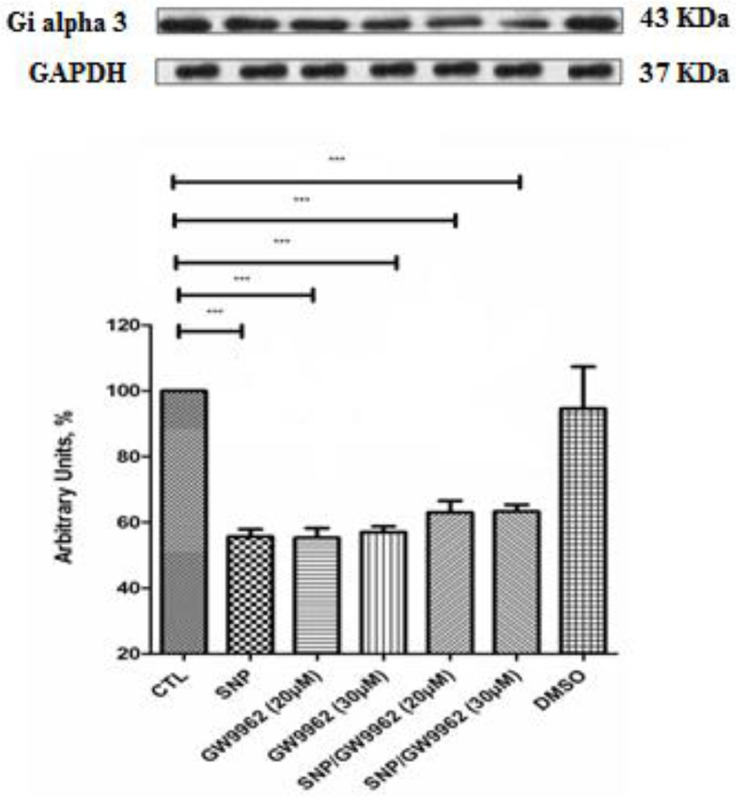 The cells were passaged upon reaching confluence with 0.5% trypsin containing 0.2% EDTA and used between passages 5 and 15 as described previously.17 Confluent cell cultures were starved by incubation for 3 h in DMEM without FBS at 37°C to reduce the interference by growth factors present in the serum. These cells were then incubated with ANG II (10-7 M) for 2 h and /or (SNP) (0.5 mM) for 24 h at 37°C. After incubation, cells were washed twice with ice-cold homogenization buffer. The cells were homogenized in a homogenization potter. The homogenate was for immunoblotting experiments. The involvement of PPAR-γ in the signaling pathway of NO in the VSMCs of the aorta was examined by the use of the specific inhibitors GW9962 (20 μmol/L) and (30μmol/L) for PPAR-γ. Western blotting for Gi, PPAR-γ, and pPPAR-γ was performed as previously described.4 After the SDS-PAGE, the separated proteins were electrophoretically transferred to a nitrocellulose membrane with a semidry transblot apparatus at 15 V for 45 min. The proteins on the membrane were stained with Rouge Ponceau S. The membranes were then blocked with 5% milk, washed twice in phosphate-buffered saline (PBS), and incubated in PBS containing 5% milk. 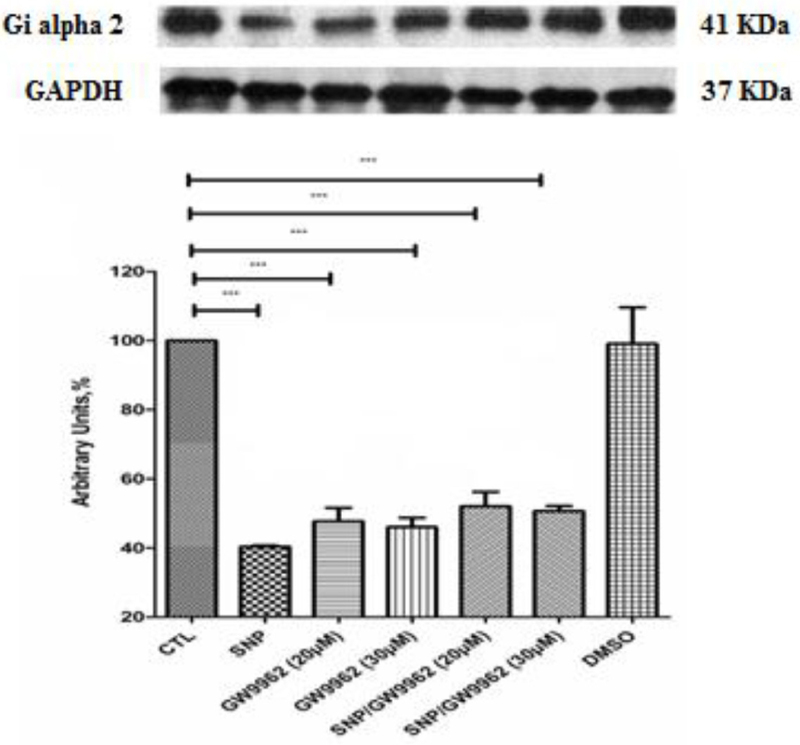 The blots were then incubated with antibodies: Giα-2, Giα-3,PPAR-γ and pPPAR-γ anti-rabbit antibodies, and GAPDH anti-mouse anti-body against GAPDH in PBS containing 5% dehydrated milk and 0.2% Tween 20 at 4°C for overnight. 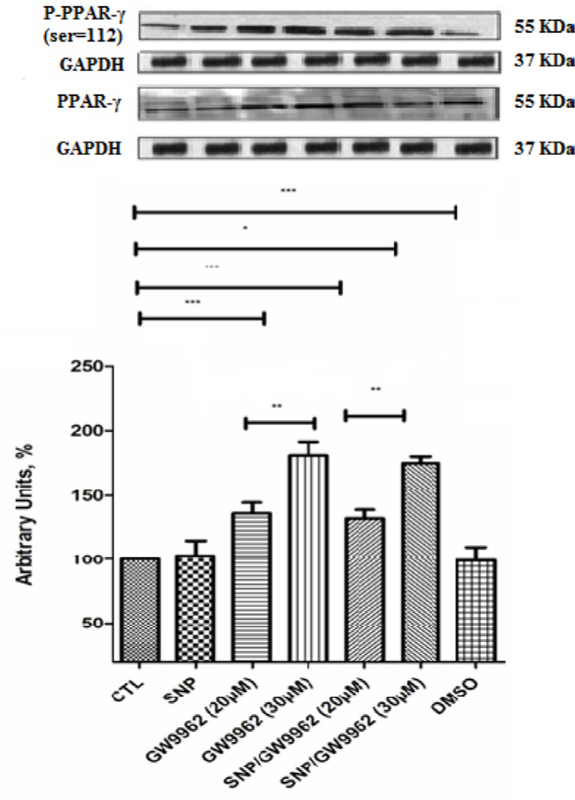 The antibody–antigen complexes were detected by incubating the membranes with goat anti-rabbit IgG, and goat anti-mouse IgG conjugated with horseradish peroxidase for 1 h at room temperature. All antibodies were purchased from Santa-Cruz,Santa Cruz, USA . The blots were then washed three times with PBS before reaction with enhanced-chemiluminescence Western-blotting detection reagents purchased from GE Amersham, Europe. The autoradiograms were quantified by densitometricscanning using a gel image reader. Differences between groups were considered statistically significant at P < 0.05. VSMCs (Figure 1) and A-10 cells (Figure 2) were treated with SNP (500 μM) and/or GW9962 (20 μM and 30 μM). 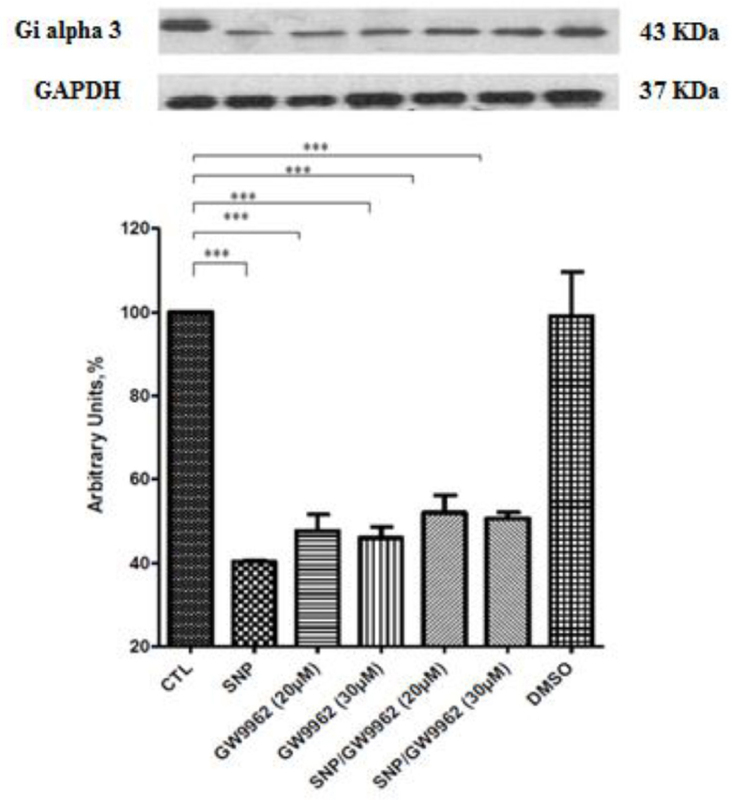 Western blotting experiments showed that these treatments uniformly decreased the levels of expression of Giα-2 in VSMCs and A-10 cells compared to control cells (CTL) or those treated with the vehicle DMSO (same volume used to treat cells with GW9962). Treatment with SNP decreased the levels of Giα-2 by 44.3% in VSMCs and 57.6% in A-10 cells. Treatment with GW9962 (20 μM and 30 μM) decreased the levels of expression of Giα-2 by 49% and 53.33% respectively in VSMCs and 62.33% and 58.66% in A-10 cells. The decreased levels of Giα-2 showed no statistical significance between individual and combination treatments with the NO donor and the PPAR-γ antagonist. Treatment with SNP/ GW9962 (20 μM) decreased the levels of Giα-2 to 52% in VSMCs and 54.3% in A-10 cells, while treatment with SNP/ GW9962 (30 μM) decreased the levels of Giα-2 to 49.33% in VSMCs and 52.66% in A-10 cells. VSMCs (Figure 3) and A-10 cells (Figure 4) were treated with SNP (500 μM) and/or GW9962 (20 μM and 30 μM). 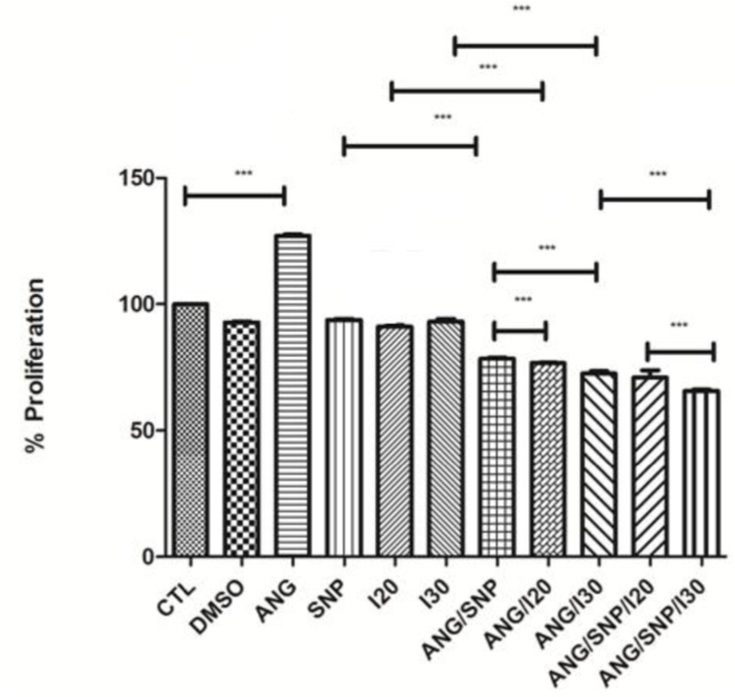 Western blotting experiments showed that these treatments uniformly decreased the levels of expression ofGiα-3 in VSMCs and A-10 cells compared to control cells or those treated with the vehicle DMSO. Treatment with SNP decreased the levels of Giα-3 by 40.33% in VSMCs and 55.67% in A-10 cells. 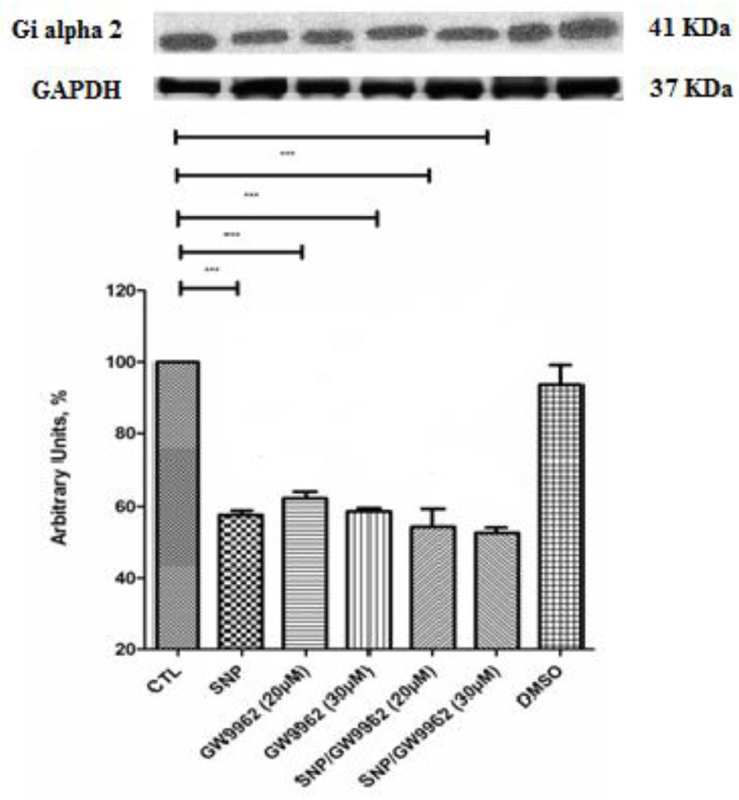 Treatment with GW9962 (20 μM and 30 μM) decreased the levels of expression of Giα-2 by 47.66% and 46% respectively in VSMCs and 55.33% and 57.0% in A-10 cells. The decreased levels of showed no statistical significance between individual and combination treatments with the NO donor and the PPAR-γ antagonist. Treatment with SNP/ GW9962 (20 μM) decreased the levels of Giα-2 to 52% in VSMCs and 54% in A-10 cells, while treatment with SNP/ GW9962 (30 μM) decreased the levels of Giα-2 to 52.66% in VSMCs and 50.66% in A-10 cells. VSMCs (Figure 5) and A-10 cells (Figure 6) were treated with SNP (500μM) and/or GW9962 (20 μM and 30 μM). 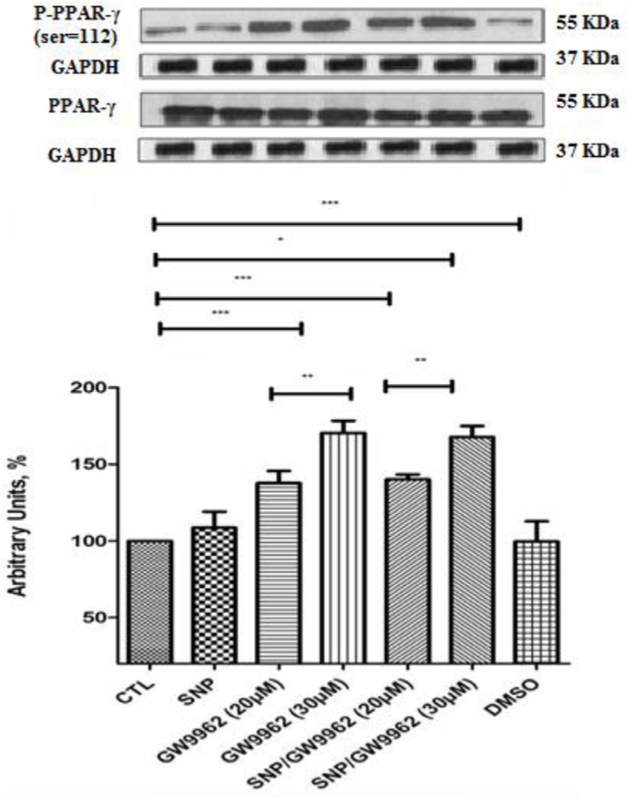 Western blotting experiments showed that treatment with SNP did not affect the ratio of phosphorylated/phosphorylated PPAR-γ in comparison to the control group and the group treated with the vehicle DMSO, and hence had no effect on the PPAR-γactivation. In contrast, treatment with PPAR-γ antagonist GW9962 at 20 μM and 30 μM dose dependently increased the ratio of phosphorylated/phosphorylated PPAR-γ compared to CTL and DMSO treated groups, thus effectively inactivating PPAR-γ. Treatment with GW9962 at 20 μM and 30 μM increased phosphorylation ratios by 37.66% and 70.33% respectively in VSMCs and 36.33% and 78.33% respectively in A-10 cells. It is important to mention that treatments with SNP and GW9962 at both concentrations had no significant effect with respect to treatments with the antagonist alone. Treatment with SNP/ GW9962 (20 μM) increased phosphorylation ratios by 32.33% in VSMCs and 43 % in A-10 cells, while treatment with SNP/ GW9962 (30 μM) increased the ration by 67.66% in VSMCs and by 75.33% in A-10 cells. The results of the proliferation test in VSMCs (Figure 7) showed that treatment of quiescent cells with the vehicle DMSO had no effect on cellular proliferation as the absorbance levels at 490 nm remained unchanged. Treatment with ANG II increased the proliferation rate of VSMCs by 26.9%. Treatment with SNP and/or GW9962 following stimulation of quiescent cells with ANG IIfor 3 hours showed that these treatments alone or in combination decreased the proliferation levels of VSMCs. Treatment with ANGII/SNP decreased the proliferation of VSMCs by 21.57%. No significant difference in proliferation rates was shown between treatments with GW9962 at both concentrations. Treatment with ANGII/GW9962 (20 μM) decreased the proliferation of VSMCs by 23.33%. Treatment with ANGII/GW9962 (30 μM) decreased the proliferation of VSMCs by 27.54%. Treatment with ANGII/SNP/GW9962 (20 μM) decreased the proliferation of VSMCs by 29.03%. Treatment with ANGII/SNP/GW9962 (30 μM) decreased the proliferation of VSMCs by 34.29%. Interestingly MTS test results showed that both treatments with SNP and GW9962 after stimulation with ANG II decreased cell proliferation rates compared to control groups, and that the combination of SNP/GW9962 had no significant change in proliferation rates compared to individual treatments. These observations have led us to conclude that PPAR-γ may not mediate the anti-proliferative effect of NO in VSMCs. In conclusion, this research project gave new insights into the role of NO and PPAR-γ in the proliferation of VSMCs and the potential relationship with Gi-protein levels. Although our results were not able establish a conclusive evidence as to the interaction between NO and PPAR-γ, but they showed that both NO donors and inhibition of PPAR-γ in non-pathological conditions regulate the decrease of VSMCs proliferation, and hence may serve as potential therapeutic targets in the prevention of the onset of vascular diseases. This research project gave new insights into the role of NO and PPAR-γ in the proliferation of VSMCs and the potential relationship with Gi-protein levels. This research showed that both NO donors and inhibition of PPAR-γ in non-pathological conditions regulate the decrease of VSMCs proliferation. We thank Dr. Hiba El Hajj, Department of Internal Medicine, Faculty of Medicine, American University of Beirut, who provided the location for the western blot technique and some valuable advices. 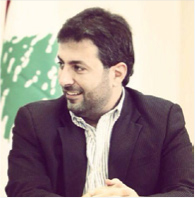 Dr. Marcel Bassil’s Personal source of funding for the publication of the manuscript and student fund research released by the faculty to undergo the studies. Cells were provided by Dr. Marcel Bassil. Equipment were provided from the common lab research facility. Lama Hamadeh, M.Sc. in Clinical Laboratory Sciences. Dr. Marcel Bassil, Ph.D, C.C.R.P. Lecturer in Clinical Laboratory Sciences program at the Faculty of Health Sciences, University of Balamand, Lebanon. Lecturer in The School of Pharmacy and Faculty of Sciences at the Lebanese University, Lebanon. Associate Director Biotechnology at Benta Pharma Industries, Lebanon. Conflicts of interest CONFLICT OF INTEREST The authors declare that they have no competing interests. Ethics and Consent statement: Not applicable. Consent to Publish: Not applicable. Presented by Availability of Data and Materials: PubMed and Medline. 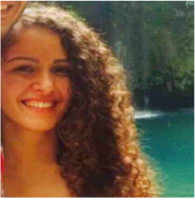 Contributed by Authors’ contributions: Ms. Lama Hamadeh is the first author, she did the techniques and wrote the thesis for her master degree. Dr. Marcel Bassil is her thesis director and mentor. The article was reviewed and corrected by Ms. Mariam Ibragim. Promega. CellTiter96 Aqueous Non-Radioactive Cell Proliferation Assay 2008 Woods Hollow Road. Madison, WI 53711-5399 USA: Promega Corporation; 2013. [updated 12/2012; cited 2013]. first edition. [Available from: www.promega.com.]. Keyword: Our Study highlights the anti-proliferative role of NO in VSMCs in relation to Giα and PPAR- γ.